PITTSBURGH — Robert Morris women’s hockey (15-13-6, 13-4-3 CHA) has finished their regular season on top of the CHA. On Saturday they closed their season with a dominant win over Syracuse (10-21-3, 10-8-2 CHA) 4-2. It was also senior day in the island honoring the six seniors on the team, Caitlyn Sadowy, Maggie LaGue, Kirsten Welsh, Amber Rennie, Lauren Bailey and Sarah Quaranta. After a very touching opening ceremony honoring the seniors a slow first period followed. Not much was worth mentioning as no goal were scored and little to no grade-a chances were earned by either teams. This all changed in the second period as the colonials would score of a offensive forecheck that saw Natalie Marcuzzi feed senior Caitlyn Sadowy for a top shelf goal at 3:20, making it 1-0. 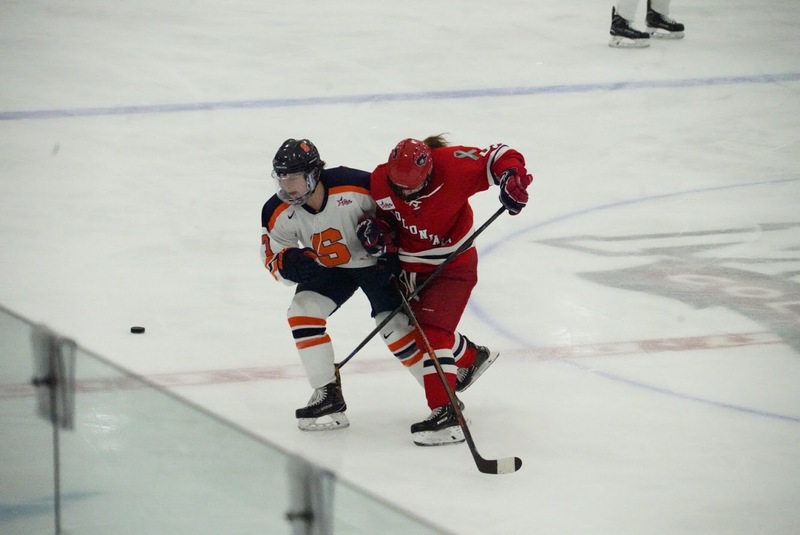 RMU would have another great chance to score later as they earned a five minute power play as Syracuse forward Kelli Rowswell shoved Jaycee Gebhard into the boards causing injury on Gebhards hand. The Colonials were unable to score on the following powerplay, but the true positive is that Gebhard would stay on the bench for the rest of the game. “They seem pretty good to be honest with you, and we will take it day by day,” stated Paul Colontino when asked about Gebhard and Sarah Lecavalier, who left yesterday’s game. It may have been senior day for the Colonials, but one could argue that it was the underclassmen day to shine. All of the next three goals for the colonials came off the sticks of underclassmen with two being first goals. The first of these was from Leah Marino as she scored her first at 10:18 from Janey Sandoval. Sandoval would get the second of these firsts and score late in the period at 18:38 making it 3-0 Robert Morris heading into the third. “It feels good and shows that the younger generation is ready to step up now,” stated Janey Sandoval. Early on in the third, Kirsten Siermanchesky would cut the lead for Syracuse with a goal that slipped by Bailey at 0:21. RMU responded soon after though as Freshman Leah Marino was not satisfied with one goal. She would add her second collegiate goal at 6:32 off of a beautiful bardown snipe and kill the momentum for Syracuse. Syracuse pressured the Colonials in the late stages of the game was they added another goal by Amanda Backebo at 14:58. This was in the midst of a late Syracuse surge in the third period where they were testing RMU’s defense. “We just had to be strong in the defensive zone. So we had to just make sure our wingers were getting to our points and blocking shots and we were boxing out in front,” stated Marino. It would be too little too late for Syracuse as RMU would close out this one with a win over Syracuse 4-2. The team seemed to view this game as a good testing game for the upcoming playoffs in Buffalo. “It is a game that didn’t have a bearing on the NCAA tournament or CHA tournament, so we had an opportunity to play different players, play more players, and get players experience in different areas. We took advantage of it and I am glad we did because our line of Janey, Rodg, and Leah was just outstanding with three goals,” stated head coach Paul Colontino. 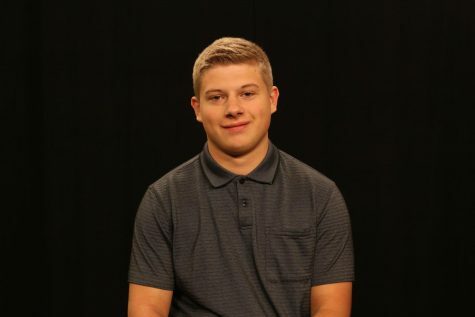 “We are so pumped coming off a big weekend and a big sweep and getting regular season champs gave us a little bit of a taste of what it would be like to raise the trophy. We are super exciting heading into playoffs and hopefully we can keep the train rolling,” Leah Marino remarked. When asked about the seniors on this team as well as the level of compete they have had over the years bench boss Paul Colontino had the following to say.